Few ailments kill an otherwise healthy dog as quickly as Bloat and Stomach Torsion. Hopefully this article will help you recognise the symptoms quickly and maybe save your dogs life. 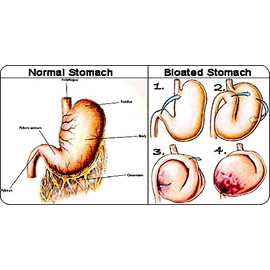 Bloat describes a stomach which has become abnormally enlarged or distended. The stomach becomes filled with gas, food, liquid, or a combination of all three. Torsion is the abnormal positioning of the stomach which is caused by the stomach twisting on it's axis. Bloat occurs when something goes wrong during digestion of food. Something causes gases to build up in the stomach so fast that the stomach blows up like a balloon, stretching the organ so much that normal circulation of blood to and from the heart is cut off. The stretching itself and the lack of blood to the stomach’s cells can cause cell death, or necrosis. What makes it even worse and more immediately serious is when the stomach actually “twists and turns” (Torsion) at the top near the oesophagus and at the bottom of the stomach at the pyloric valve. Gas is trapped and can’t escape as a burp or the other end as “passing gas.” The gas builds and builds as it becomes trapped within the stomach. The stomach grows so large it cuts off circulation, as mentioned above, and irreversible damage is done to the cells. The dog goes into shock and then cardiac arrest. This can happen within several hours after the start of bloat. That is why if you suspect your dog is experiencing this problem, you must RUSH THE DOG IMMEDIATELY to the vet or animal hospital. 1. Large meals eaten once a day. They recommend serving your dog two smaller meals a day, rather than just one big one. 2. Rigorous exercise done either right before a meal or right after one. You should wait at least one hour before feeding after exercise and one hour after eating before you let your dog run around. 3. If only dry food is given, some people moisten it with water if it is a top quality dog food. However, with lesser quality foods, less meat-based dog food, the ones that are mostly grains, it is better to NOT wet the food, since water mixed with grain will start fermentation, a process that has by-products of gas. But if the food is mostly meat, it's OK, and can actually help with digestion. 4. Gulping large amounts of water during meals. Keep water within the dog’s reach at all times, except during meals. 1. Dog’s Breed—Large-breed dogs are most susceptible, although on occasion, small dogs may bloat too. 2. Dogs that are “deep-chested.” This means the length of the chest from backbone to sternum is long and the width of the chest is narrower. 3. Dogs that have ancestor-history of bloating. It’s thought to be hereditary. 4. Underweight, or thin, dogs. 5. Anxious or fearful temperament. These dogs should always eat in an environment made as peaceful as possible for them. 6. Aggressive dogs, “nerves” or emotions can play a role in triggering a bloat episode. 7. Male dogs get it more than females. 8. Dogs older than seven years of age are more at risk than those that are younger. Know your dog. Most of the symptoms are behavioral, at least in the very beginning, so your dog will start to act differently. The abdomen is stretched to many times its normal size due to an increase in gas. It will blow up like a balloon and is one of the first most obvious signs. In some cases, this part of the bloat event can’t be seen. But, usually you can see the distended abdomen which will also feel very hard to the touch, like a ball that has been pumped up with too much air. This event causes SEVERE abdominal pain. So, you may see that your dog is acting uncomfortable, pacing the floor, not being about to find a comfortable position to lie down or may make sounds like he is in pain. The biggest, most obvious symptom is that the dog appears to be nauseated. He will unsuccessfully attempt to vomit and will retch and gag, but nothing comes up, or very little, if any. He will also attempt to have a bowel movement, assume the position, but again, nothing comes out. Excessive drooling is also a common symptom. IF ANY OF THESE THINGS HAPPEN, CALL YOUR VET OR RUSH YOUR DOG TO THE NEAREST ANIMAL HOSPITAL. It is better to be safe than sorry. As mentioned earlier, there are only a few hours available to handle this problem, so time is everything in a case of bloat. Your vet will put everything else aside to address your dog’s condition. There are only two basic things that are done to the dog in the case of bloat. The first thing a vet may try is to insert a tube down the throat making a passage for the gas to escape. But if the stomach has twisted volvulus, surgery is the only solution. The vet will have to make an incision into the stomach and relieve the gas that way. While in there, he may decide to perform what is called gastropexy. This is where the stomach is actually stapled into its normal position, or anchored into place, so that it cannot blow up should there be another episode of bloat. Even if the dog has been relieved of the bloat with just a tube and not surgery, he should be surgically examined regardless, so that the vet may assess the damage done by the episode. Damaged parts of the stomach may need to be removed, or the patient’s owner may decide to allow gastroplexy since many dogs that experience bloat often go through it again at a later date. Sometimes only a day or two later, they may bloat again.